This course is geared towards architects and spatial designers who wish to enhance their workflow with parametric and data rich modeling capabilities. From concept design to documentation, every stage of the design process is an opportunity to increase efficiency and creativity. This course has been designed to give architects access to simulation, analysis, and advanced modeling capabilities in order to better inform and execute design decisions throughout the design process. 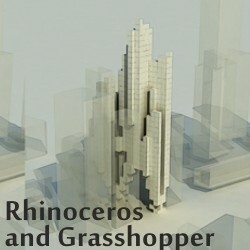 During the 24-hour course, we will look at the relationship between Rhino 5, Grasshopper, and associated plug-ins to create workflow tools that can be tailored to optimize the potential of each project. This three day seminar / workshop will explore strategies for applying parametric design for the purpose of generating informed architectural models. During the course, participants will learn how to connect a digital model to external data sources such as environmental data and GIS databases. The participants will also learn how to evolve designs to reach multiple objective optimizations. The course will combine the functionality of native Rhino and Grasshopper methods with plug-ins and add-ons which address analysis, evaluation, environmental design, gis data, objective driven optimization, and general workflow.